Sorry I haven't posted in a few weeks, been sorting things out and making some big changes in my life but I'M BACK! -and ready to get back into blogging once again! This month I have been using a lot of different products, experimenting more and coming out of my comfort zone with beauty. Trying new foundations, to experimenting with different eye looks and lip colours. I've tried a lot of different brands which I have never ventured into before, but always loved the look of.. Here are my end of the month loves of the moment, and products which have turned into my Go-Tos, in my makeup and beauty world. This Lip liner is an absolute must for me at the moment, especially on nights out and occasions when I want to have a more bold lip. I'm someone that when it comes to lips, its the last priority with my makeup and something I usually skip (don't judge! ), rarely having time for it in every day use. This is as there so high maintenance most the time! I tend to most the time go for a really natural look on my lips, with either just a vaseline, gloss or really neutral colour, or do the complete opposite and go all out - theres no in-between! Soar is a lip liner which on me is quite a muted rosey dark pink, one I tend to pair with a more natural eye look and winged eyeliner. This colour I absolutely adore and I always go back to when i'm looking for a little pop of colour on my lips. I pair this with ----------- lip stick which is almost identical to the colour, just in lipstick form, making the liner last a lot longer and put a little more life into my lips. I had heard about this colour through the hype when Kylie Jenner was using it, but never bothered to get it because it was just sold out everywhere! But, I thought i'd treat myself and try it out, and I absolutely love it! A defininate must have for me at the moment! This foundation I bought as an impulse, as I had heard the hype of it for years. I was wondering round the Nars counter one day, just in one of those 'f*** it' moods, and minutes later came out with a new foundation! I love those moments! From hearing bloggers such as Sammie Maria (beautycrush) as well as many more people using this I knew it had to be good. When I first used this I thought it seemed slightly yellow compared to my Esteé Lauder Double Wear Foundation I use at the moment, but it actually looked so much more natural! Think foundation give a beautiful glow and is a gorgeous medium coverage, but very buildable and just looks seemless on your skin like your not wearing anything! Definitely one of my new favs! Better than Esteé Lauder Double Wear Foundation? -Different. I now switch between the two daily. Using Esteé Lauders on days I want a heavier coverage. Worth the price? - 100%, it's pretty pricey I admit but you definitely get what your paying for and is definitely one I will be repurchasing along the line. Fave primers are something I've always been a little cautious of. I hate to add another layer of makeup to my skin unnecessarily, 1 because what's the point if it doesn't work, and 2 because it takes longer! However, this primer is a miracal worker! You don't feel like you have it on your skin and it's soft and creaminess just makes the best base for you makeup to sit on top of. As someone that suffers from hyper pigmentation on my cheeks, this works like magic! It completely evens out my skin tone and corrects and redness with the slight green tint it has to it- a current holy grain! So thank you mum for buying me this one, I now can't like without it! From hearing good things about the sleek eyeshadow palettes from Chloe Morton, glitteralittle on YouTube, who's videos are one of my favourites - I looked into them and thought I'd give this one a go. The colours are stunning, so pigmented!! From great matte brown transition shades, to gorgeous all over shimmers. 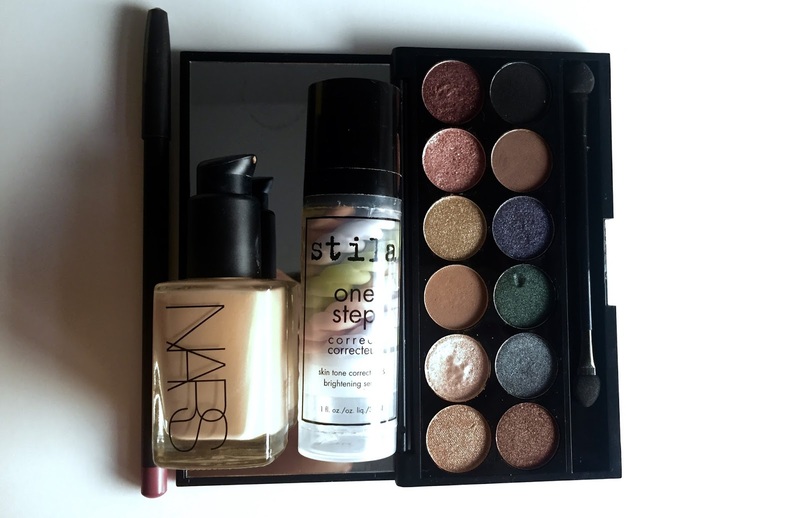 I love how the shimmers are mostly paired, meaning you have a look made all in one just from this one palette! I'll definitely be looking into getting more of these palettes. So that's the round up of all my favourite beauty products of the moment - Sorry I've been gone so long again! But i'm back and ready to post weekly again.